Create a bold, dramatic look with Forever’s Sonya™ precision liquid eyeliner's deep carbon pigment that creates crisp, sleek lines. With 9 skin conditioners in the formula - like our skin enhancing aloe vera, castor oil, vitamin E (also an antioxidant!) 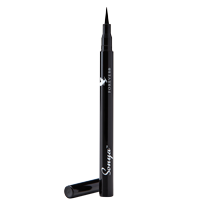 and sunflower seed oil, this smudge-proof liner is gentle on eyes. These conditioners also help the liner gently sweep across your lid, so skin isn’t pulled and tugged during application.